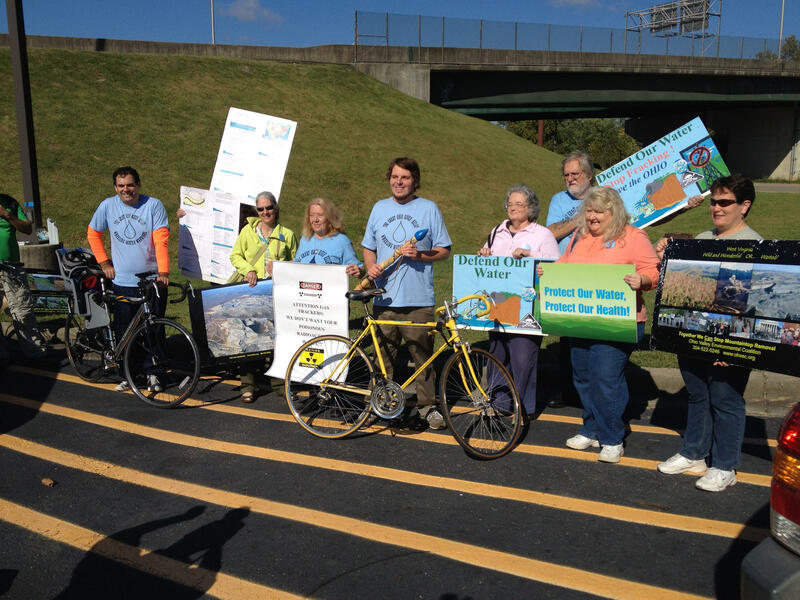 Ohio Valley Environmental Coalition and Wheeling Water Warriors hold rally in Huntington. Members of the Ohio Valley Environmental Coalition hosted a rally Monday morning in Huntington. Members of Ohio Valley Environmental Coalition and Wheeling Water Warriors hold a rally in Huntington. Their effort focuses on shedding light on the transfer of waste water on barges. The Ohio Valley Environmental Coalition hosted a group from the northern panhandle called the Wheeling Water Warriors. This group of Wheeling Warriors organized after a waste water treatment plant was proposed to be built near Wheeling. Since then they have led a charge that includes organizing The Great Ohio River Relay. Robin Mahonen is with the Wheeling Water Warriors. “We’re opposed to fracking, we’re opposed to the environmental damage that it causes and in particular our water. You need water for life, you can live without gas, we’ve done it as a species for thousands of years, and you cannot live without water,” Mahonen said. "You need water for life, you can live without gas, we've done it as a species for thousands of years, and you cannot live without water,' Mahonen said. Participants of The Great Ohio River Relay are passing a baton the length of the Ohio River. After receiving the baton members of the Ohio Valley Environmental Coalition or OVEC brought the baton by bikes to downtown Huntington. Robin Blakeman is with OVEC and helped organize the rally. “The Great Ohio River Relay is a baton relay, moving the baton by people powered means, bicycles, canoes, kayaks or rolling blading, the entire length of the Ohio River. It started in Pittsburgh September 14th and is now in Huntington, but they’re trying to get it all the way to Cairo, Illinois,” Blakeman said. Once they received the baton in Huntington Monday morning, members of OVEC and the Wheeling Water Warriors held a small rally with around 15 people. They’re spreading the word about plans that may be in the works to transport waste water from deep shale gas sites by barges to waste water treatment plants like the one proposed in Wheeling. The activists hope to alert the public to the dangers of transporting the waste water in barges that travel the Ohio River. Mahonen said the relay has meaning for each of the groups that will play a part in passing the baton. “It’s a symbolic thing for one, for another it unites all of the fracking activists along the river and I think that’s very important right now, we have had some small victories in those towns, but you only hear about it in those towns. And a lot of people in the cities still don’t know what fracking is or what it means,” Mahonen said. After the rally concluded, which included singing and speeches from different members of the two groups the baton was transported from the rally, across the 6th street bridge in Huntington, over to a boat ramp on the Ohio side of the river. From there it was passed off to be taken by a canoe a few miles down the river to Ironton, Ohio. 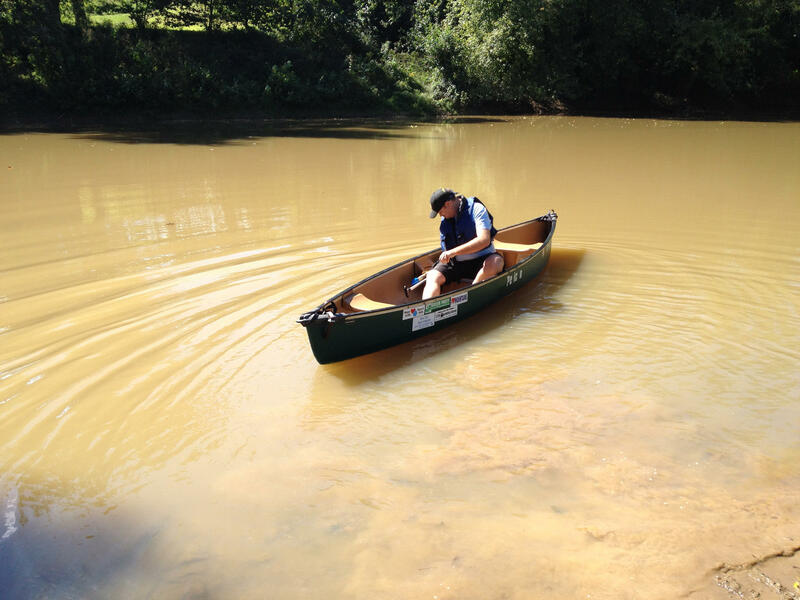 Baton beings trip down Ohio River by canoe. Vivian Stockman is with the Ohio Valley Environmental Coalition and hopes that this makes people think about the source of water they have in the Ohio. “What we are hoping people will do is think about where water comes from, think about the fact that water truly is life and what we’re doing in terms of extreme energy extraction to water and what we should be doing protecting water and protecting human health,” Stockman said. OVEC volunteers are passing the baton from Pt. Pleasant to Greenup, Kentucky.